Winter is coming and your snow tires may need to be replaced. Rather than forking over full price, a little research and a bit of haggling could net you some quality used ones. When buying anything used, it’s buyer beware so here’s what you need to know in order to avoid getting burned. Determine your tire size and what they would cost new. Most tires are discounted from list prices by as much as 33 per cent. The exception to this rule is Michelin, which is only discounted by 10 to 12 per cent. Then take another 25 per cent off for used in good condition and this is a starting point for bargaining. When shopping for used tires take a ruler and a small flashlight with you. Read on to find out how these tools will help you in your search. If you buy from a dealer, be sure to check that they are all the same model, size and tread pattern, as tires could have been mixed up on the back of a truck. Then check date codes which are marked on the side wall. The code will start with “DOT.” The first two letters represent the tire manufacturer and the plant code. 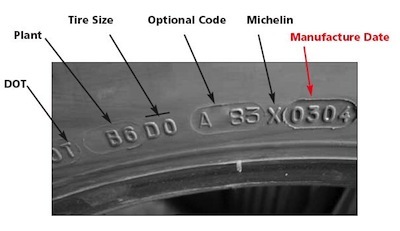 The third and fourth characters are the code for the size of the tire and the fifth to eighth characters identify the tire brand more specifically. The ninth and 10th numbers are the week the tire was made and the last two numbers are the last two digits of the year they were made. Make sure that all four tires were made in the same year. Winter tires are good for up to four or five winters. The older they are, the cheaper they should be. No DOT number is a red flag. It means that the tires were not legally made for use in North America, so don’t buy them. 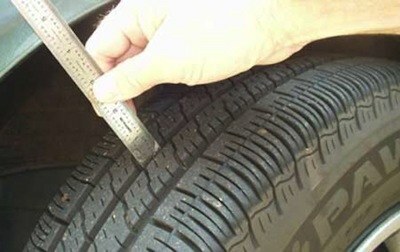 Take out your ruler to check tread depth and measure randomly all around the tire, not just in one spot. All measurements should be very close in depth. New tire tread depth is between 11 and 13 millimeters. If the tread is under half of that depth, the tire is probably past its usefulness. Check that the tread blocks are flexible, which is essential for winter tires. Shine your flashlight in the valleys between the tread blocks and look for cracks. Cracks indicate that the rubber has been incorrectly stored or over-heated. If you see any plugs in the tire, which look like circles of rubber five to eight millimeters in diameter, that means the tire has been repaired. That’s alright as long as it was plugged properly with a patch-plug. If you don’t see a corresponding patch on the inside of the tire, don’t buy it. If, when checking the inside of the tire, you catch a whiff of heat or burning, the tire was run hot while it was flat and is good only for scrap. Check the area where the tire sits on the rim for any rips or tears. Cuts or rips make the tire worthless. Should a tire pass that test, roll it along the floor and watch for any side-wall bulges. The tire shouldn’t wobble and the tread pattern should run straight and not oscillate from side to side. If a tire shop is storing the tires you’re considering in a steel cargo container in the sun, give them a pass. Too much heat is death to rubber. Armed with this essential information, you’ll be ready to start your hunt for quality used snow tires that will get you through the worst the coming season has to offer. I just invest in a good set of chains, you can keep them for years to come. I personally wouldn’t trust using used tires. Especially in the winter. There is too much risk in the tread being worn down to drive on icy roads.